HDClone’s CopyEngine, the actual copying algorithm, has been completely reworked from ground up. Already ranking in the top range of performance, the CopyEngine has been improved with special attention to SSDs and we managed to achieve an up to 65% improvement in performance for single copies of fast SSDs. Already balancing the load excellently, the improvment for multi copies is slightly lower: The 8% improvment in performance is nonetheless remarkable. HDClone allows copies from dynamic disks on regular disks and RAID systems. This offers a reliable way of a reverse migration, something not possible with Windows tools. This feature is not solely intended for expert users managing a dynamic disk set, it also allows users having accidently transformed their disk to a single dynamic disk to undo this mistake by transforming their dynamic disk back to a regular disk. Of course HDClone still allows for copies of arbitrary dynamic disk sets and partitions thereof onto regular disks. HDClone can access Intel Software RAIDs (also known as Intel Matrix Storage) in modes 0, 1, 10 and 5 in the self-booting version (HDClone/S). Intel Software RAIDs can be used just like regular hardware RAID systems. TRIM commands are used by HDClone to tell the SSD which disk areas are no longer needed. In addition to higher copying speed the SSD gains its original performance afterwards, resulting in higher reading and writing speed. For over 30 years, 512 Bytes have been the one-and-only standard sector size for any PC mass storage media. Now modern drives in “Advanced Format” can have different sector sizes (512, 512e, 1Kn, and 4Kn). 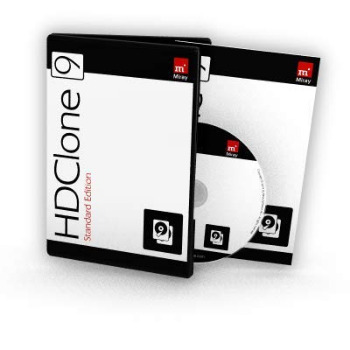 HDClone allows you to create clones and file images between disks with different sector formats and converts NTFS and FAT file systems automatically. Allows to select one or more partitions of a disk to be transferred without having to copy all the partitions. This saves space on the target drive, making it possible to use a smaller target or using the additional space for the remaining partitions. The special thing about PartitionSelect is that it transfers the required data in one single step, no matter what size the partitions have or how they are arranged. Copying the partitions, plus other adjustments will be performed with almost no extra time required and HDClone will still work at its maximum speed. HDClone can be booted from CD/DVD, floppy and USB stick, even on SecureBoot systems, so you even can recover an image without a working operating system. With identical interfaces on both programs there is complete ease in switching between the self-booting version and the Windows program and supports USB and Bluetooth mice and keyboards. Instead of a direct copy from medium to medium, you can also store an exact image of the medium in a file image. Optionally, the image may be created compressed or encrypted. With QuickCompress ennabled, this requires almost no extra time for compressing. These file images can be stored, archived, or transmitted via network and the Internet. They can be restored 1:1 to a medium which then behaves just like a direct copy had been made. HDClone can also create dynamic VMDK/VHD(X)/VDI images. Such an image can be mounted directly in VMware, VirtualPC and VirtualBox virtual machines. HDClone includes the software Miray Virtual Disk. You can use this software to mount file images that have been created with HDClone (including VHDX/VDI) as virtual Windows drives. This allows you to access files and folders in an image directly without having to restore the image to a physical disk before. Images can be accessed read-only or writable, and changes made to the images can by deployed with HDClone’s image-restore feature. This feature allows HDClone to run on computers with new UEFI BIOS. GPT partitions used for large (> 2 TB) hard disks are recognized automatically and copied correctly. HDClone creates logical sector copies (SmartCopy) of FAT, NTFS, HFS+ and ext2/ext3/ext4 file systems in only a fraction of the time usually needed—yielding an equivalent result. SmartCopy can clone an entire Windows XP base installation in less than 20 seconds for example. HDClone can increase your FAT, NTFS, HFS+ and ext2/ext3/ext4 partition size automatically on the fly during copying. HDClone can decrease your NTFS, FAT and HFS+ partition size automatically on the fly during copying. This allows you to adjust partition sizes during cloning or to migrate to smaller media. Perfect for migrating to (usually smaller) SSD drives. HDClone can perform a perfect defragmentation on NTFS, FAT and HFS+ volumes while copying or restoring from a file image. This defragmentation only needs a fraction of the time usually required, consuming almost no additional time compared to the copying process. Starting from the Professional Edition, HDClone can be launched in the command line of Windows. This enables cloning tasks to be executed time-triggered and/or scripted. Drives can be selected by Windows ID (dynamic), port number (fixed, IDE/SATA/SCSI only), or media ID (fixed, drive name/serial). HDClone now can create copies and file images of drives and partitions during Windows operation – even for the system volume. When copying from media with defective areas these areas will be skipped in the first run. The rescue operation will be performed at the end of the process to prevent further disk damage.